Our Patron, George Caulkin, worked with Sir Bobby as a football journalist and wrote his final book, My Kind of Toon, with him. George has written this piece about Sir Bobby’s legacy especially for our 10th anniversary. Sir Bobby Robson’s working life began in the murk of Langley Park Colliery. From the age of 15, as a trainee electrician, his day would start with a three mile trek from the pit shaft to the coalface, along “subterranean corridors,” as he put it, “deep below the fields and football pitches of my beloved North East.” For 18 months he inhabited a darkened world, a touchstone for the rest of his existence. Philip, Sir Bobby’s father, grafted in the mining industry for 51 years and missed just a single shift, an ethic which was welded to his son, who was brought up to value “unity, self-reliance, helping others,” the knowledge that his safety depended on others and theirs depended on him. Being part of a team, the very point of a team, was as vital to him as oxygen. It is what he was and what he breathed. Soon enough, Bobby’s career would be defined by the glare of floodlights rather than the gloom of the mine, but he never quite scrubbed the coal dust from his pores. As football led him across the country and then around the world, he viewed himself as an ambassador for our region and the qualities he absorbed at Langley Park. They kept him humble, hungry and compassionate. He was only ever as strong as those around him. When we consider Bobby’s legacy, we think about England and Italia 1990, about Paul Gascoigne’s tears and that twinkling summer, alive with possibility. We consider the miraculous transformation of Ipswich Town. We marvel at his bravery in heading to the continent, to Holland, Spain and Portugal – rare now, but rarer then – and we recall that blissful rebuilding of Newcastle United, his boyhood club, those Champions League nights. Yet of the things which made and continue to make this great man relevant, football is one detail in a wider conversation. It may not even be the most important part, because his legacy can be found in the spirit which persuades people to organise coffee mornings or sponsored walks, to put their hands in their pockets while thinking of others, to sweat and grimace through 13.1 miles of running and in countless other feats of endurance. 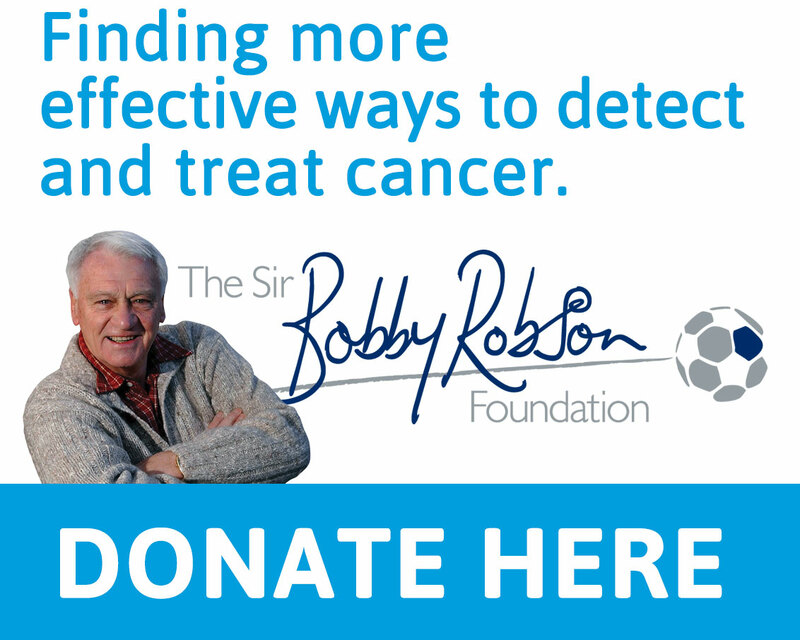 It can be found amid microscopes and machinery and lasers, in the cutting-edge research which the Sir Bobby Robson Foundation funds, in the treatment rooms and wards. It can be found in the indomitable folk who put themselves forward for clinical trials. It can be found in the nursing posts, in the people who care, in those who are tasked with making patients feel better. Sometimes, surrounded by hardship, you can see it in a smile. On the day he was appointed Newcastle manager, Bobby challenged a journalist to a race around the pitch. He was always the first into training and the last to leave. In his later years, he would crow to Lady Elsie about being as fit as a fiddle, about never missing work. She would remind him – you can imagine the little tut or the roll of the eyes – about having cancer five times, but it bounced off him. He had such a zest for life. 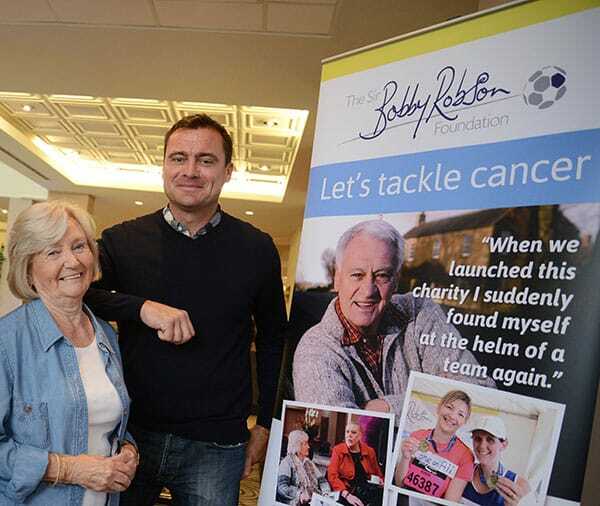 When Sir Bobby launched his Foundation in 2008, it was to raise £500,000 to equip a new trials facility at the Northern Centre for Cancer Care in Newcastle. He did it with his usual zeal and enthusiasm and described it as “like being at the helm of a team again,” his “last and greatest team.” Even when his body was failing, he attended meetings and events and, naturally, he went to football matches. Fans he met would thrust notes and coins into his hands. He was funny, charming and dignified, but Bobby could be stubborn, too. You do not endure in football without being tough and nobody said that being in a team is easy. But it also makes us stronger, a collective will, a collective effort, part of something bigger than the individual, straining together for something better, pushing ourselves, reliant on each other. It is what Bobby learned covered in coal dust and £12m later, this is his legacy. You are his legacy. We are.